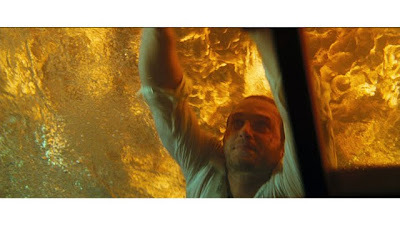 Whether it's actually been in disaster movies or elsewhere, we've all seen the disasters that can occur when directors rely far too heavily on CGI to the point where the actors look stiff and there's absolutely no connection between the characters and the audience. 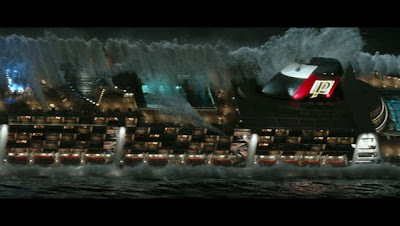 And even though Wolfgang Petersen's disaster movie Poseidon broke new ground for the sheer amount of CGI that was used in creating a large scale ship and its eventual sinking when a one hundred and fifty foot rogue wave crashes into a luxury ocean-liner on New Year's Eve, the end result is the opposite of a disaster but a strong third and final installment in the director's water trilogy following Das Boot and The Perfect Storm. 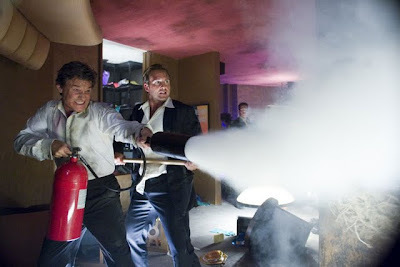 In addition to the seamless blend of computer created visual effects, incredible stunts largely carried out by the courageous cast were executed along with elaborate production effects involving fire, heights, close quarters and every other phobia known to mankind. 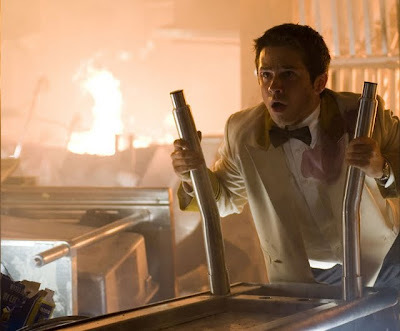 The third filmed adaptation based on Paul Gallico's novel The Poseidon Adventure, Peterson's 2006 effort is also the best disaster movie release since Titanic in terms of sheer awe, audacious scale, and storytelling. However, instead of being able to watch a love story unfold in a lengthy fashion, within the opening act of Poseidon, the wave hits and what we're left with is individuals in crisis mode where their backgrounds are unimportant and they must discover their inner strength and bravery to try and survive a sinking ship. 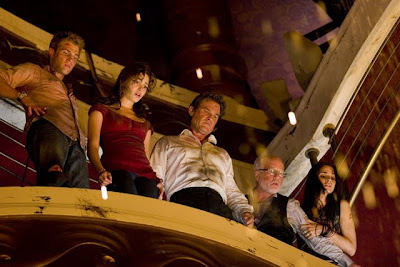 While the captain (Homicide: Life on the Streets star Andre Braugher) must seal off the glass ballroom in order to preserve the maximum number of guests who'd been celebrating the New Year oblivious to the impending threat, a small group of men and women led by former mayor and fireman Kurt Russell and an ex-Navy sailor Josh Lucas decide to venture onward. Journeying through air ducts, in between walls, bypassing bodies and hazards at every turn to try and stay above the water to escape out towards a lifeboat, we watch them during successes and devastating losses during roughly ninety harrowing minutes. While admittedly the character development is minimal, in essence Poseidon is everything that Speed 2: Cruise Control should've been. Namely, it's one breathtakingly intense hell of a boat ride wherein you'll quickly turn into the moviegoers you love to judge at the theatre for talking by yelling at the screen, wiping sweaty palms on your jeans, and begging them to hold their breaths a little longer as they plunge under water to get from one insurmountable obstacle to the next, unsure of what awaits them, or if someone will have to be sacrificed in the process. Instead of taking the '70s cheesy, over-the-top circus approach, Petersen's film is something that transcends remake into the type of horrifying testament to what we can do as a team urging each other on. 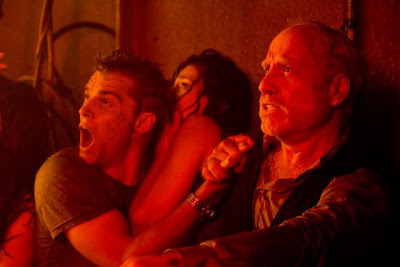 Likewise, in my mind, it surpasses the disconcerting fiction meets fact effort of Perfect Storm as well as Roland Emmerich's effects heavy, hammer-the-jokes home end-of-the-world movies like another recent disaster release in the form of 2012. In its recent high definition release, Warner Brothers delivers a strong, crisp Blu-ray bursting with special features that even casual movie fans will love to explore as you gain a newfound appreciation for the cast's decision to go through everything we see and Petersen's unique vision. Additionally, the WB Blu debut has phenomenal sonic and visual power that doesn't lose a thing on a smaller screen. Similarly, it continues to engage even on a second viewing when this reviewer was aware of which characters were going to see the journey through to the end and which would perish along the way. Overall, Poseidon is textbook CGI that – like Rodriguez's innovative mastery of the effects in Sin City -- is sure to inspire those working in the field and those who are also in dire need of a reminder of just what “good CGI” looks like in a filmmaking market that's over-saturated with it.